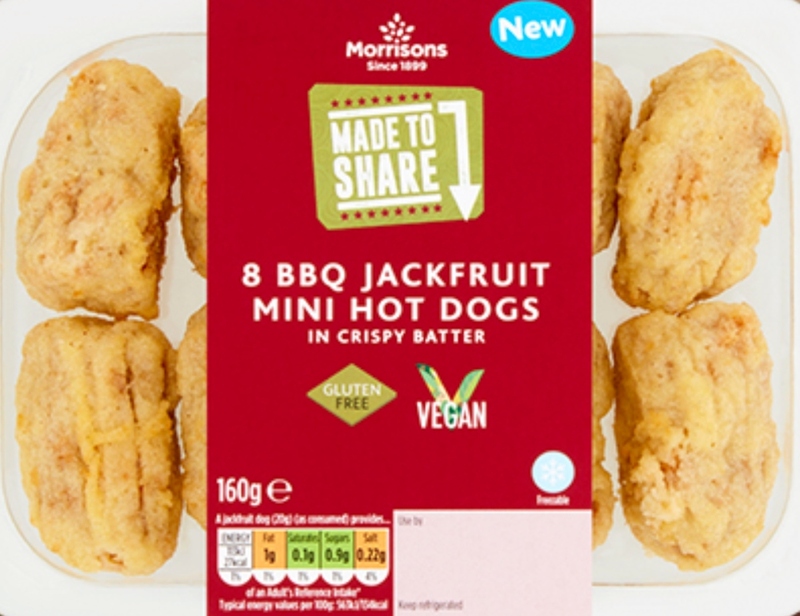 UK supermarket Morrisons has launched new vegan BBQ Jackfruit Mini Hot Dogs. According to the store, they are similar to corndogs, with a 'meaty' filling made from BBQ jackfruit and a crispy coating (which is gluten-free). "This is like a traditional American corndog, but with a smoky BBQ vegan twist," Morrisons Party Food Buyer, Oliver Smith, told Vegan Food & Living. "We hope these are a hit with customers at parties this summer." The new dogs follow another recent party food launch - Morrisons' V Taste No-Moozarella Sticks, made from a mixture of coconut oil and potato starch, coated in a crispy parsley breadcrumb. "We know a lot of our vegan customers really miss cheese and that their options are often limited at family buffets,"Morrisons Party Food Buyer, Oliver Smith, said in a statement sent to Plant Based News. "[This] is why we've taken a classic cheesy party food that everyone knows and loves and made it vegan." Last year, the store launched its own range of vegan products called V Taste, which features more than 10 products, includes two flavors of vegan cupcakes - red velvet and chocolate - as well as a number of savory dishes. These include Lentil Hotpot, 3 Bean Chilli Non Carne, and Vegetarian Quarter Pounders, among others. All items are priced between £1 and £3. Announcing the range, Morrisons said: "Our NEW Vegan Range, V Taste, has landed in store. "Choose from a selection of totally #vegan ready meals to try at home. In store look out for the vegan logo on hundreds of our products." In addition to launching its own vegan products, Morrisons pledged last year to clearly mark all of its own-brand items that are animal-free, following the lead of Tesco, Asda and Aldi. The move followed campaign called #MarkItVegan launched by animal protection organization Animal Aid. "We are absolutely delighted that Morrisons has made the decision to start to label its own-brand vegan products," Animal Aid Vegan Outreach Campaign Manager, Tod Bradbury, said. "This will make a huge difference to vegans, and those shopping for vegans, as well as anybody who is thinking about including more plant-based foods in their diet. Up until this point, Morrisons had been inconsistent with its vegan labeling, so this will clear up any confusion that this may have caused, and mean that those purchasing vegan products can do so in confidence."